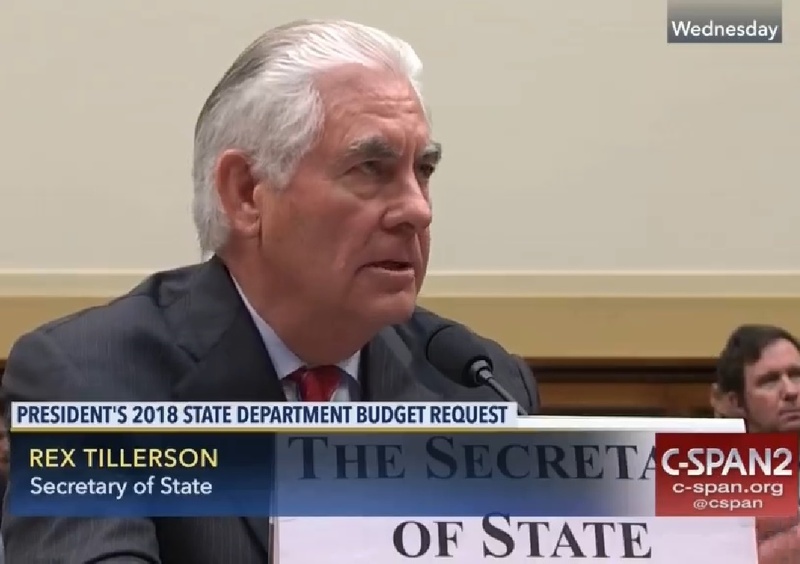 On June 14, Secretary of State Rex Tillerson implied that the United States supports regime change in Iran, which would be a significant departure from U.S. policy under previous administrations. Representative Ted Poe (R-TX) asked Tillerson, who was testifying on the budget request for the State Department and USAID, if the United States supports peaceful regime change. “Our policy towards Iran is to push back on this hegemony, contain their ability to develop nuclear weapons, and to work towards support of those elements inside of Iran that would lead to a peaceful transition of that government,” Tillerson told the House Foreign Affairs Committee. Iranian Foreign Minister Mohammad Javad Zarif condemned Tillerson’s remarks in a series of tweets. “Before reverting to unlawful & delusional regime-change policy towards #Iran, US Administration should study and learn from history,” he wrote. Zarif was referencing the CIA-led 1953 coup that overthrew Prime Minister Mohammad Mossadegh’s government and restored the monarchy. In 2000, Secretary of State Madeleine Albright formally apologized for the U.S. role. But Iranian officials, including the supreme leader, have continued to accuse Washington of trying to foment regime change. The following are Tillerson’s remarks with reactions from Iranian officials. Rep. Ted Poe (R-TX): The State Department can lead the effort to designate the IRGC (Islamic Revolutionary Guard Corps) as a state – or as a sponsor of terror. I personally think that the State Department should designate them as a sponsor of terror under 13224 and I would hope that would be on your radar to do. They are doing bad things throughout the world, on behalf of terrorism and destroying human rights of many people. I’d like to know what the policy is of the U.S. toward Iran. Do we support the current regime? Do we support a philosophy of a regime change – peaceful regime change? There are Iranians in exile all over the world, some are here, and then there are Iranians in Iran that don’t support the totalitarian state. So is the U.S. position to leave things as they are or support a peaceful long-term regime change? Secretary of State Tillerson: Well our Iranian policy is under development, it has not yet been presented to the president, but I will tell you that we certainly recognize Iran’s continued destabilizing presence in the region, their payment of foreign fighters, their export of militia forces in Syria, in Iraq, in Yemen, their support for Hezbollah. And we are taking action to respond to Iran’s hegemony. Additional sanctions actions have been put in place against individuals and others. We continually review the merits, both from the standpoint of diplomatic, but also international consequences of designating the Iranian Revolutionary Guard in its entirety as a terrorist organization – as you know we have designated the Quds. Our policy towards Iran is to push back on this hegemony, contain their ability to develop nuclear weapons, and to work towards support of those elements inside of Iran that would lead to a peaceful transition of that government. Those elements are there, certainly as we know. 2. This statement is a brazen interventionist plan that runs counter to every norm and principle of international law, as well as the letter and spirit of UN Charter, and constitutes an unacceptable behavior in international relations. 3. This statement is also a flagrant violation of the 1981 Algiers Accords and other treaty obligations to which the United States is a party. 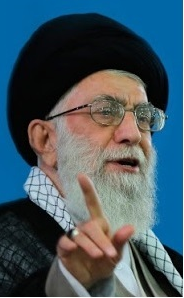 According to the Algiers Accords, 'the United States pledges that it is and from now on will be the policy of the United States not to intervene, directly or indirectly, politically or militarily, in Iran’s internal affairs'. 4. Interestingly, Mr. Tillerson’s statement coincides with the release of newly declassified documents that further clarify how the US agencies were behind the overthrow of Dr. Mohammad Mossadegh, the popular and democratically elected Prime Minister of Iran, on 19 August 1953. That CIA-backed coup abruptly interrupted the path of Iran towards independence, democracy and development and imposed and upheld a 25-year long dictatorship that left deep scars on the Iranian society and its collective conscience. 5. It also came weeks after vibrant presidential and local elections in Iran in which more than 71 percent of the Iranian people participated. The people of Iran have repeatedly proven that they are the ones to decide their own destiny and thus US attempts to interfere in Iran domestic affairs will be doomed to failure. They have learned how to stand strong and independent, as demonstrated in the 1979 Islamic Revolution. 6. The Iranian government expects that all States condemn such grotesque policy statements and advise the US government to act responsibly and to adhere to principles of the UN Charter and international law.